In England during the 17th and 18th centuries 22 November was observed as St. Cecilia’s Day with musical performances to honor this patron saint of church music. In 1736 and 1739, with his Alexander’s Feast and the Ode for St. Cecilia’s Day, based on texts by the poet John Dryden, Handel made important contributions to the festivities. Indeed, Handel took Purcell’s Cecilian odes as models, but through the use of recitatives, arias and large choruses he approached the oratorio. 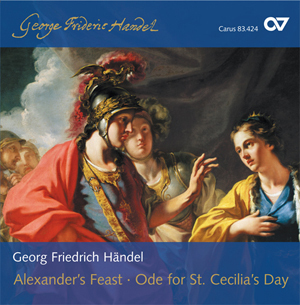 Both pieces were quickly recognized by contemporaries as outstanding works and already in 1739 Handel joined them together, whereby the Cecilian Ode served as the third part of Alexander’s Feast. In the years following, this practice was frequently maintained, however, beginning in the late 19th century this meaningful type of performance practice was increasingly forgotten. Carus has again joined the two works together in the present performance with Simone Kermes, the Kölner Kammerchor, and the Collegium Cartusianum, under the direction of Peter Neumann.